Home / -Touring- / Goo Goo Dolls / Johnny Rzeznik / Touring / Goo Goo Dolls Announce Summer Tour With Video on the Overexposed "Iris"
Goo Goo Dolls Announce Summer Tour With Video on the Overexposed "Iris"
Johnny Rzeznik says to expect a bit more of the Goo Goo Dolls on this summer's tour. Rzeznik told Billboard that the band's shows are going to be longer. Obviously we’re going to play all the hits, but we’re going to go a lot deeper in the catalog." That catalog is fairly deep with eleven studio albums and a brand new four-song EP, You Should Be Happy, which was released on Friday (May 12), and twelve top ten hits on Billboards Adult Pop Songs chart. To announce the tour, Rzeznik released a video on building the playlist and that one song of the band's that seems to be everywhere. 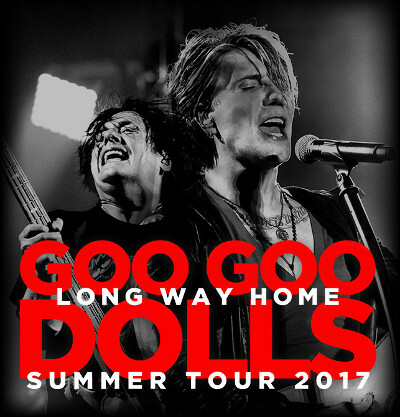 The Goo Goo Dolls are bringing along American Idol season 11 winner (and the last Idol winner to impact the charts) Phillip Phillips. The band is currently made up of original members Rzeznik and Robby Takac and touring members Brad Fernquist and Korel Tunador, who both joined in 2006, and Craig MacIntyre, who joined in 2014.